Tinker to Chance: Game Makers Rethinking an Orthodoxy? 2K Sports caught plenty by surprise when it said it was taking a break from its NHL series, not killing it outright as many suspected. I hold out hope that it's a sign the orthodoxy of sports publishing is changing. For roughly 15 years, games of NHL 2K's classification - a league-licensed team sports sim - have built up the expectation that a publisher paying for that league's branding and its players name had damn well better put out a title every year. But that thinking is largely rooted in a time when sports games were not as expensive to produce, (and the economy was better), there was little to no online distribution, and every publisher who could afford the licensing fee could see some justifiable revenue streams. Currently an underdog sports game faces a hellish demand unique in games development: Innovating on a one-year cycle and trying to close the quality gap overall with a direct competitor producing essentially the same type of game. And success at either of those does not guarantee a commensurate sales boost. (See NBA Live 10, regarded as a strong improvement, but a disappointment at the cash register.) Overall, if the sales didn't justify the game, the publisher pulled out for good. And as we've seen recently, the contraction of sports titles have left the landscape with less competition. Take-Two Interactive is trying a third way, akin to a runner who's had enough slowing down the treadmill rather than quitting his workout. It'll continue its motion control-enabled NHL title on the Wii, where 2K Sports publishes unopposed and says it's seen a good reaction from Canadian gamers. But Xbox 360 and PlayStation 3 versions will take a one-year break and return in 2011. "Take-Two is trying to make money on NHL 2K, and it's likely that the game doesn't sell enough volume to turn a profit," said Michael Pachter, the well known games industry analyst for Wedbush Securites. "If they bring it out every other year, they will probably sell twice as many units, two years' worth, with lower development and marketing cost, and they may be more profitable." This, of course, is a big if. 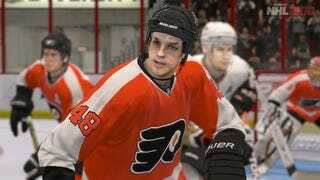 EA Sports' NHL is widely, and justifiably, regarded as the superior product by the sports gaming cognoscenti. A year out of the game for NHL 2K will harden EA NHL's advantage in that sector, and it'll also reap the dollars from less discriminating customers who may have bought the competition. But when 2K Sports comes back it'll probably be fighting for those who don't buy a hockey game every year, and that's a market less likely to follow or value the reputations of studios and their ongoing franchises. Don't expect a game put on a two-year development cycle to be twice as good, however. "I am pretty confident that they won't put an additional year of development into the game, but will deploy those programmers on other sports projects," Pachter says, and I agree. Take-Two isn't acting in anyone's interests other than its own, but if it can succeed on an every-other-year basis with NHL 2K, it at least preserves a customer option and results in one less monopoly on a licensed game. And I think it helps move the industry toward something many gamers wish would happen but hasn't yet - producing higher quality retail games on longer development cycles, while taking care of the annual needs (rosters, uniform changes, scheduling) through updates. It's just that, if this is the first step in that direction, it's being taken by the runner-up in hockey, and not, say EA Sports' Madden franchise. Regarding Madden, my ears perked up when I heard Peter Moore earlier in the week tell investors EA Sports needed "to move much quicker, in particular with Madden, through a digital world." He said we could expect news this year on how EA Sports plans "to digitize the Madden consumer." They've dipped their toes into this with microtransaction DLC that unlocks adjunctive content not essential to any aspect of the game. Now, it sounds like they're going to start selling and delivering some more of the essential or expected components of the game online. So for a split second I honestly and naively thought we might begin to see a major sports brand lurching into that theoretical retail/DLC model that so many sports gamers fantasize about. Except right now, there's little incentive for a game to do so, especially one whose retail version moves six million units a year. Madden's a year-in-year-out moneymaker and something that value-minded gamers can pay $60 for and play throughout the real-life season, ditch it on the used market in March and then buy the next one in August. "Peter is talking about capturing some value from all of this additional game play on his sports games, by charging to be able to reach different levels, unlock skills, players, teams, uniforms, etc., and perhaps is considering charging a subscription to play in leagues or multiplayer," Pachter surmises. Further, if Madden can convince a gamer to hang on to his copy until the next one comes out, that's one less resale copy out there poaching off a full sale to EA Sports. That's the proactive incentive for EA to create a valuable experience online. EA could, of course, just make parts of the game unlockable only with a free code included in a retail release, forcing buyers of used games to pony up online. "The likely way to charge is for the fantasy experience," Pachter says. Again, I concur. The only way gamers would tolerate paying for core components like rosters is if they were buying a retail version of the game once every two years at most. This doesn't dent a publisher's bottom line as much as one might expect. Under such a model, Pachter would expect publishers to see, roughly speaking, a 10 percent gain in revenue, based on an assumption that "the average guy will buy the game and one download." The reason there is, again, roughly speaking, retail gets 20 percent of a game's price, and there's a 20 percent tribute paid to the platform holder. Digital distribution, the fee is 30 percent to the platform holder and that's it. All that would assume that, for that one download (whether a piece of content or an entitlement such as a roster update subscription), a publisher is charging something in excess of what people are currently paying for content that isn't a full game, and that gamers would be willing to spring for it. Especially if they still had to pay $60 for a retail version that, even if they no longer have to buy it every year, has still had some of its guts put online. "This will be a gradual migration," Pachter says. "You'll see tinkering until they get it right." And that's what this is right now. Tinkering. Taking a game to a two-year development cycle is an experiment. Figuring out which content to digitize is another. They're tinkering. But the publishers are not alone in the process; they're simply putting out the stimulus. Sports gamers will provide the response.